The Helix from Ride has been replicated with a few mutations from last year's model to give you the maximum in freestyle performance. 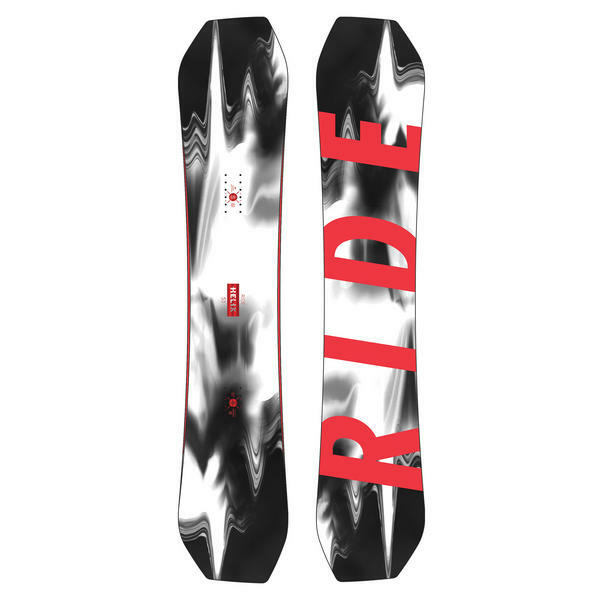 The Helix features RIDE's Twin Camber shape and a slightly softer flex than last year's model, but the asymmetric sidecut is what truly sets the Helix apart. The radius of the sidecut on your heelside edge is deeper than the radius on your toeside edge, giving you more leverage over your heelside turns. This anatomically correct board shape allows you to power through turns easier on your heelside edge. The Helix is a go anywhere, do anything freestyle deck and a favorite of team rider, cloning test subject and slopestyle contest dominator Yuki Kadono. Twin boards have a symmetrical shape, which have the same length nose and tail. This makes riding switch a lot easier. These boards are more specific for freestyle and park riding. Classic all mountain freestyle binding that is comfortable everywhere. The Fuse offer a fantastic fit and is loaded with features. Slopestyle master, ideal for those seeking progression. Jack of all, Master of all!!! !